Hi friends, happy Wednesday! I've started a new long term project last week and I'm so excited to share with you today! My family and friends in real life know I love all things American! and can talk endlessly about the many, many different places I want to visit! You only have to take a look at my Pinterest board 'places to see' and realise it's actually just the U.S. I want to see, ha! So of course I love all things Americana - those patriotic red, white and blue colour's always seem to draw me in. Each week we get a little embroidery pattern, called a 'teeny weeny'. With a short blurb about that particular state, and why the said embroidery pattern has been chosen - which I completely love, as I get to learn a little fact about the different state's each week. And yes, I have already tried to casually bring into conversion the fact that Delaware was once described by Thomas Jefferson as a diamond, 'small but valuable'. lol. 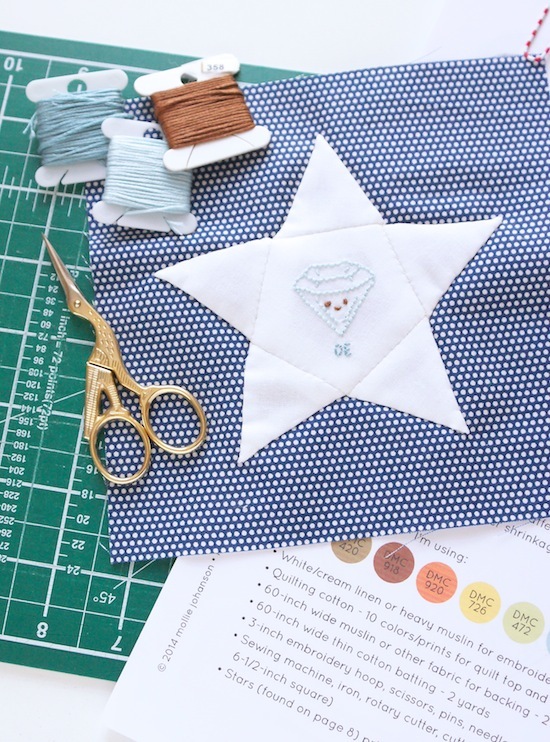 At the end of the 52 weeks of sewing we should end up with a complete set of state star blocks, and alternating stripe blocks to make a quilt. What also caught my eye with this pattern is the use of English Paper Piecing techniques! Yay! Once you have embroidered the motif it's then mounted on a pentagon shape, with equilateral triangles for the points to form a star. The only snag with the pattern for me is the EPP shapes don't follow a standard size so I can't use my Paper Pieces shapes for them, doh! the 2" size is too big and the 1" is too small... so I had to cut out my own, which I didn't realise takes for-ev-er, and isn't always very accurate I came to learn. Oh how I've spoiled myself with pre-cuts! Mollie has suggested a decorate running stitch to applique the star to the block but I've gone a little more minimalist using an invisible slip-stitch. I've chosen to keep mine with a patriotic feel using traditional colour's, and Kona White for the stars - it just felt right! Hmm, you post answered my question! I am just starting the 50 States and was coming to you for the PP shapes. But if you had to cut them, I guess I will too! Bummer!